This tutorial demonstrates the mode-decomposition feature which is used to decompose a given mode profile via the Fourier-transformed fields into a superposition of harmonic basis modes. Examples are provided for two kinds of modes in lossless, dielectric media: (1) localized (i.e., guided) and (2) non-localized (i.e., radiative planewave). This example involves computing the reflectance of the fundamental mode of a linear waveguide taper. The structure and the simulation parameters are shown in the schematic below. We will verify that computing the reflectance, the fraction of the incident power which is reflected, using two different methods produces nearly identical results: (1) mode decomposition and (2) Poynting flux. 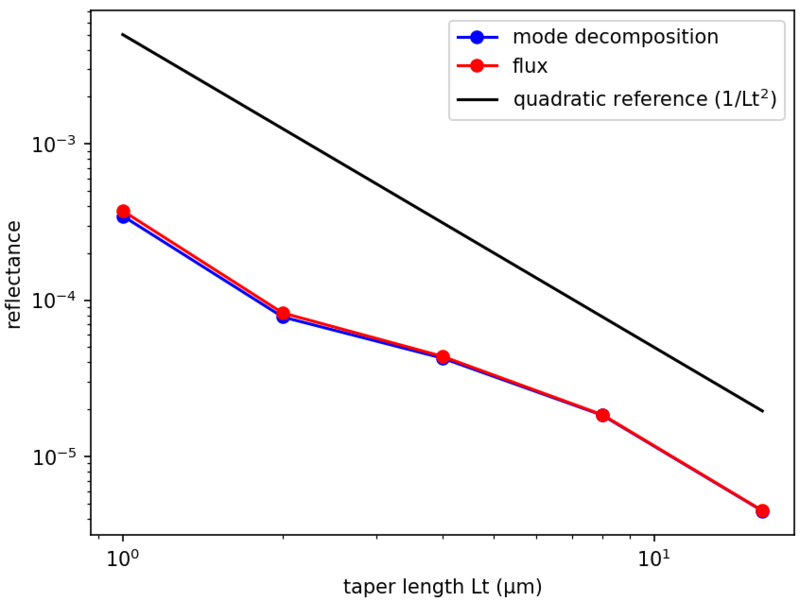 Also, we will demonstrate that the scaling of the reflectance with the taper length is quadratic, consistent with analytical results from Optics Express, Vol. 16, pp. 11376-92, 2008. The structure, which can be viewed as a two-port network, consists of a single-mode waveguide of width 1 μm (w1) at a wavelength of 6.67 μm and coupled to a second waveguide of width 2 μm (w2) via a linearly-sloped taper of variable length Lt. The material is silicon with ε=12. The taper geometry is defined using a single prism object with eight vertices. PML absorbing boundaries surround the entire cell. An eigenmode current source with Ez polarization is used to launch the fundamental mode. The dispersion relation (or "band diagram") of the single-mode waveguide is shown in Tutorial/Eigenmode Source. There is an eigenmode-expansion monitor placed at the midpoint of the first waveguide. This is a line monitor which extends beyond the waveguide in order to span the entire mode profile including its evanescent tails. The Fourier-transformed fields along this line monitor are used to compute the basis coefficients of the harmonic modes. These are computed separately via the eigenmode solver MPB. This is described in Mode Decomposition where it is also shown that the squared magnitude of the mode coefficient is equivalent to the power (Poynting flux) in the given eigenmode. The ratio of the complex mode coefficients can be used to compute the S parameters. In this example, we are computing |S11|2 which is the reflectance (shown in the lines prefixed by "refl:,"). Another line monitor could have been placed in the second waveguide to compute the transmittance or |S21|2 into the various guided modes (since the second waveguide is multi mode). The scattered power into the radiative modes can then be computed as 1-|S11|2-|S21|2. As usual, a normalization run is required involving a straight waveguide to compute the power in the source. The structure has mirror symmetry in the direction which can be exploited to reduce the computation size by a factor of two. This requires that we use add-flux rather than add-mode-monitor (which is not optimized for symmetry) and specify the eig-parity keyword argument as ODD-Z+EVEN-Y in the call to get-eigenmode-coefficients. The simulation script is in examples/mode-decomposition.ctl. The results are plotted using the Octave/Matlab script below. The plot is shown in the accompanying figure. The reflectance values computed using the two methods are nearly identical. For reference, a line with quadratic scaling is shown in black. The reflectance of the linear waveguide taper decreases quadratically with the taper length which is consistent with the analytic theory. 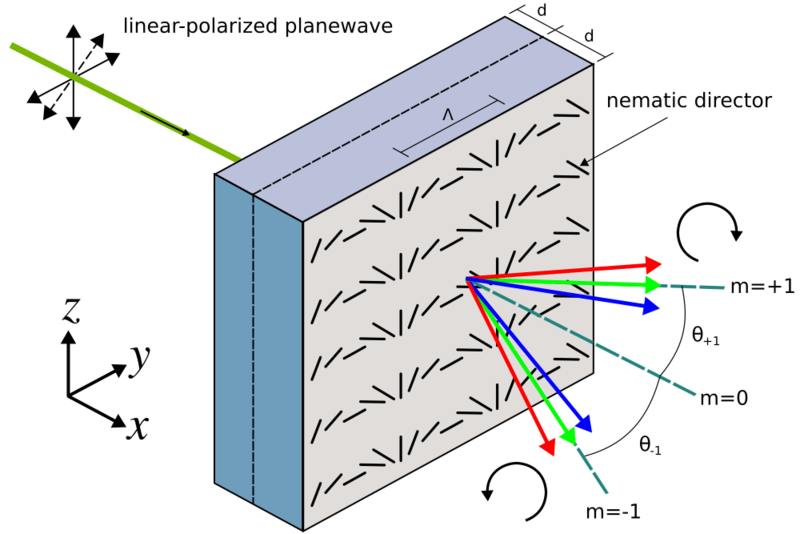 The mode-decomposition feature can also be applied to planewaves in homogeneous media with scalar permittivity/permeability (i.e., no anisotropy). This will be demonstrated in this example to compute the diffraction spectrum of a binary phase grating. The unit cell geometry of the grating is shown in the schematic below. The grating is periodic in the direction with periodicity gp and has a rectangular profile of height gh and duty cycle gdc. The grating parameters are gh=0.5 μm, gdc=0.5, and gp=10 μm. There is a semi-infinite substrate of thickness dsub adjacent to the grating. The substrate and grating are glass with a refractive index of 1.5. The surrounding is air/vacuum. Perfectly matched layers (PML) of thickness dpml are used in the boundaries. A pulsed planewave with Ez polarization spanning wavelengths of 0.4 to 0.6 μm is normally incident on the grating from the glass substrate. The eigenmode monitor is placed in the air region. We will use mode decomposition to compute the transmittance — the ratio of the power in the direction of the diffracted mode relative to that of the incident planewave — for the first ten diffraction orders. Two simulations are required: (1) an empty cell of homogeneous glass to obtain the incident power of the source, and (2) the grating structure to obtain the diffraction orders. At the end of the simulation, the wavelength, angle, and transmittance for each diffraction order are computed. The simulation script is in examples/binary_grating.ctl. Note the use of the keyword parameter argument #eig-parity (+ ODD-Z EVEN-Y) in the call to get-eigenmode-coefficients. This is important for specifying non-degenerate modes in MPB since the k-point is (0,0,0). ODD-Z is for modes with Ez polarization. EVEN-Y is necessary since each diffraction order which is based on a given kx consists of two modes: one going in the +y direction and the other in the -y direction. EVEN-Y forces MPB to compute only the +ky + -ky (cosine) mode. As a result, the total transmittance must be halved in this case to obtain the transmittance for the individual +ky or -ky mode. For ODD-Y, MPB will compute the +ky - -ky (sine) mode but this will have zero power because the source is even. If the parity is left out, MPB will return a random superposition of the cosine and sine modes. Alternatively, in this example an input planewave with Hz instead of Ez polarization can be used which requires #eig_parity (+ EVEN-Z ODD-Y) as well as an odd mirror symmetry plane in y. Finally, note the use of add-flux instead of add-mode-monitor when using symmetries. The diffraction spectrum is then plotted using the following Octave/Matlab script and shown in the figure below. Each diffraction order corresponds to a single angle. In the figure below, this angle is represented by the lower boundary of each labeled region. For example, the m=0 order has a diffraction angle of 0° at all wavelengths. The representation of the diffraction orders as finite angular regions is an artifact of Octave/Matlab's pcolor routine. Note that only the positive diffraction orders are shown as these are equivalent to the negative orders due to the symmetry of the source and the structure. The transmittance of each diffraction order should ideally be a constant for all wavelengths. The slight wavelength dependence shown in the figure is due to numerical discretization which can be mitigated by increasing the resolution. The diffraction orders/modes are a finite set of propagating planewaves. The wavevector kx of these modes can be computed analytically: for a frequency of ω (in c=1 units), these propagating modes are the real solutions of sqrt(ω²n²-(ky+2πm/Λ)²) where m is the diffraction order (an integer), Λ is the periodicity of the grating, and n is the refractive index of the propagating medium. In this example, n=1, ky=0, and Λ=10 μm. Thus, at a wavelength of 0.5 μm there are a total of 20 diffraction orders of which we only computed the first 10. The wavevector kx is used to compute the angle of the diffraction order as cos-1(kx/(ωn)). Evanescent modes, those with an imaginary kx, exist for |m|>20 but these modes carry no power. Note that currently Meep does not compute the number of propagating modes for you. If the mode number passed to get-eigenmode-coefficients is larger than the number of propagating modes at a given frequency/wavelength, MPB's Newton solver will fail to converge and will return zero for the mode coefficient. It is therefore a good idea to know beforehand the number of propagating modes. In the limit where the grating periodicity is much larger than the wavelength and the size of the diffracting element (i.e., more than 10 times), as it is in this example, the diffraction efficiency can be computed analytically using scalar theory. This is described in the OpenCourseWare Optics course in the Lecture 16 (Gratings: Amplitude and Phase, Sinusoidal and Binary) notes and video. For a review of scalar diffraction theory, see Chapter 3 ("Analysis of Two-Dimensional Signals and Systems") of Introduction to Fourier Optics (fourth edition) by J.W. Goodman. From the scalar theory, the diffraction efficiency of the binary grating is 4/(mπ)2 when the phase difference between the propagating distance in the glass relative to the same distance in air is π. The phase difference/contrast is (2π/λ)(n-1)s where λ is the wavelength, n is the refractive index of the grating, and s is the propagation distance in the grating (gh in the script). A special feature of the binary grating is that the diffraction efficiency is 0 for all even orders. This is verified by the diffraction spectrum shown above. To convert the diffraction efficiency into transmittance in the x direction (in order to be able to compare the scalar-theory results with those from Meep), the diffraction efficiency must be multiplied by the Fresnel transmittance from air to glass and by the cosine of the diffraction angle. 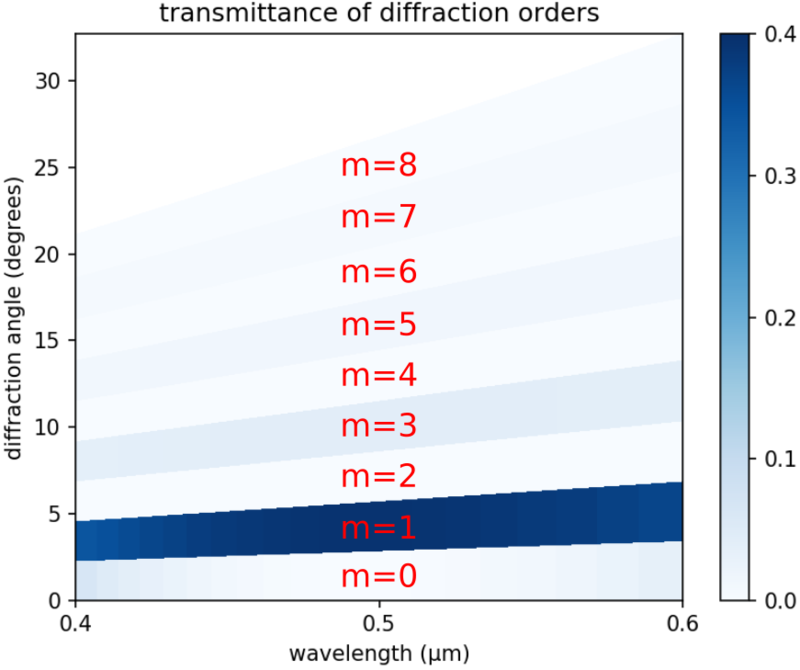 We compare the analytic and simulated results at a wavelength of 0.5 μm for diffraction orders 1 (2.9°), 3 (8.6°), 5 (14.5°), and 7 (20.5°). The analytic results are 0.3886, 0.0427, 0.0151, and 0.0074. The Meep results are 0.3891, 0.04287, 0.0152, and 0.0076. This corresponds to relative errors of approximately 1.3%, 0.4%, 0.8%, and 2.1% which indicates good agreement. As an additional demonstration of the mode-decomposition feature, the reflectance and transmittance of all diffracted orders for any grating with no material absorption and a planewave source incident at any arbitrary angle and wavelength must necessarily sum to unity. Also, the total reflectance and transmittance must be equivalent to values computed using the Poynting flux. This demonstration is somewhat similar to the single-mode waveguide example. The following script is adapted from the previous binary-grating example involving a normally-incident planewave. The total reflectance, transmittance, and their sum are displayed at the end of the simulation on two separate lines prefixed by mode-coeff: and poynting-flux:. Results are computed for a single wavelength of 0.5 μm. The pulsed planewave is incident at an angle of 10.7°. Its spatial profile is defined using the source amplitude function pw-amp. This anonymous function takes two arguments, the wavevector and a point in space (both vector3s), and returns a function of one argument which defines the planewave amplitude at that point. A narrow bandwidth pulse is used in order to mitigate the intrinsic discretization effects of the Yee grid for oblique planewaves. Also, the stop-when-fields-decayed termination criteria is replaced with a fixed run time run-sources+ 100, etc. As a general rule of thumb, the more oblique the planewave source, the longer the run time required to ensure accurate results. There is an additional line monitor between the source and the grating for computing the reflectance. The angle of each reflected/transmitted mode, which can be positive or negative, is computed using its dominant planewave vector. Since the oblique source breaks the symmetry in the direction, each diffracted order must be computed separately. In total, there are 59 reflected and 39 transmitted orders. The simulation script is in examples/binary_grating_oblique.ctl. (define-param use-cw-solver? false)       ; CW solver or time stepping? Since this is a single-wavelength calculation, the frequency-domain solver can be used instead of time stepping for a possible performance enhancement. The only changes necessary to the original script are to replace two objects: (1) gaussian-src with continuous-src and (2) run-sources+ with solve-cw. Choosing which approach to use is determined by the use-cw-solver? boolean variable. In this example, mainly because of the oblique source, the frequency-domain solver converges slowly and is less efficient than the time-stepping simulation. The results from both approaches are nearly identical. Time stepping is therefore the default. The following are several lines of output for eight of the reflected and transmitted orders. The first numerical column is the mode number, the second is the mode angle (in degrees), and the third is the fraction of the input power that is concentrated in the mode. Note that the thirteenth transmitted order at 19.18° contains nearly 38% of the input power. The first numerical column is the total reflectance, the second is the total transmittance, and the third is their sum. Results from the mode coefficients agree with the Poynting flux values to three decimal places. Also, the total reflectance and transmittance sum to unity. These results indicate that approximately 6% of the input power is reflected and the remaining 94% is transmitted. We can also use the complex mode coefficients to compute the phase (or impedance) of the diffraction orders. This can be used to generate a phase map of the binary grating as a function of its geometric parameters. 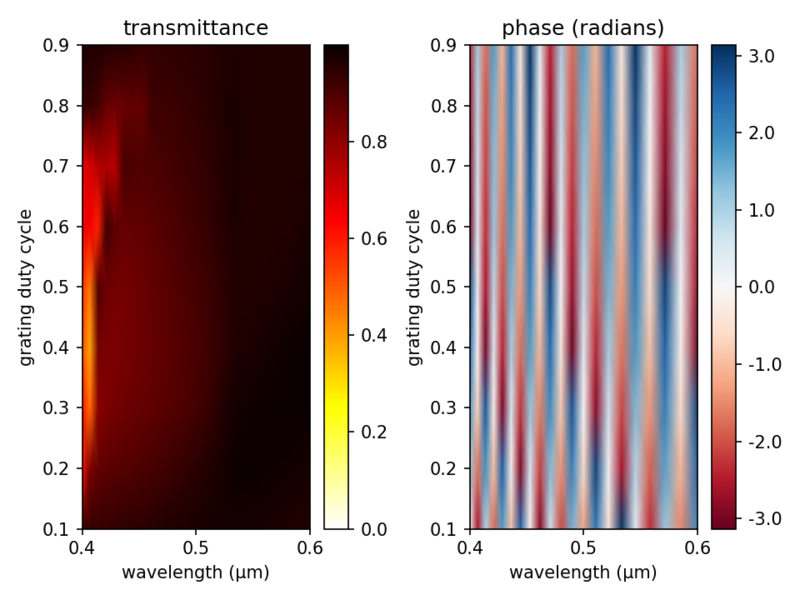 Phase maps are important for the design of subwavelength phase shifters such as those used in a metasurface lens. When the period of the unit cell is subwavelength, the zeroth-diffraction order is the only propagating wave. In this demonstration, which is adapted from the previous example, we compute the transmittance spectra and phase map of the zeroth-diffraction order (at 0°) for an Ez-polarized planewave pulse spanning wavelengths of 0.4 to 0.6 μm which is normally incident on a binary grating with a periodicity of 0.35 μm and height of 0.6 μm. The duty cycle of the grating is varied from 0.1 to 0.9 in separate runs. The simulation script is in examples/binary_grating_phasemap.ctl. The phase of the zeroth-diffraction order is simply the angle of its complex mode coefficient. Note that it is generally only the relative phase (the phase difference) between different structures that is useful. The overall mode coefficient α is multiplied by a complex number given by the source amplitude, as well as an arbitrary (but deterministic) phase choice by the mode solver MPB — but as long as you keep the current source fixed as you vary the parameters of the structure, the relative phases are meaningful. The figure below shows the transmittance spectra (left) and phase map (right). The transmittance is nearly unity over most of the parameter space mainly because of the subwavlength dimensions of the grating. The phase variation spans the full range of -π to +π at each wavelength but varies weakly with the duty cycle due to the relatively low index of the glass grating. Higher-index materials such as titanium dioxide (TiO2) generally provide more control over the phase. As a final demonstration of mode decomposition, we compute the diffraction spectrum of a liquid-crystal polarization grating. These types of beam splitters use birefringence to produce diffraction orders which are circularly polarized. 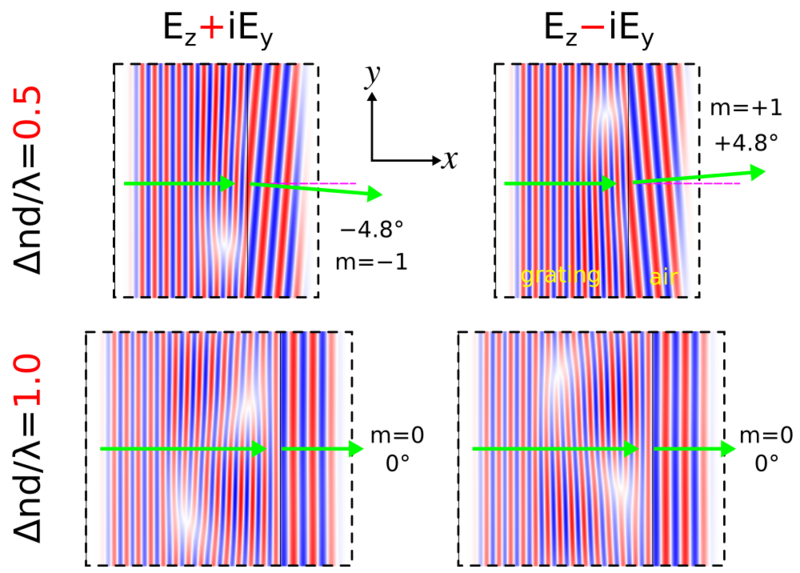 We will investigate two kinds of polarization gratings: (1) a homogeneous uniaxial grating (commonly known as a circular-polarization grating), and (2) a twisted-nematic bilayer grating as described in Optics Letters, Vol. 33, No. 20, pp. 2287-9, 2008 (pdf). The homogeneous uniaxial grating is just a special case of the twisted-nematic grating with a nematic director rotation angle of φ=0°. A schematic of the grating geometry is shown below. The grating is a 2d slab in the xy-plane with two parameters: birefringence (Δn) and thickness (d). The twisted-nematic grating consists of two layers of thickness d each with equal and opposite rotation angles of φ=70° for the nematic director. Both gratings contain only three diffraction orders: m=0, ±1. The m=0 order is linearly polarized and the m=±1 orders are circularly polarized with opposite chirality. For the uniaxial grating, the diffraction efficiencies for a mode with wavelength λ can be computed analytically: η0=cos2(πΔnd/λ), η±1=0.5sin2(πΔnd/λ). The derivation of these formulas is presented in Optics Letters, Vol. 24, No. 9, pp. 584-6, 1999. We will verify these analytic results and also demonstrate that the twisted-nematic grating produces a broader bandwidth response for the ±1 orders than the homogeneous uniaxial grating. An important property of these polarization gratings for e.g. display applications is that for a circular-polarized input planewave and phase delay (Δnd/λ) of nearly 0.5, there is only a single diffraction order (+1 or -1) with opposite chiraity to that of the input. This is also demonstrated below. In this example, the input is a linear-polarized planewave pulse at normal incidence with center wavelength of λ=0.54 μm. The linear polarization is in the yz-plane with a rotation angle of 45° counter clockwise around the x axis. Two sets of mode coefficients are computed in the air region adjacent to the grating for each orthogonal polarization: ODD-Z+EVEN-Y and EVEN-Z+ODD-Y, which correspond to +ky + -ky (cosine) and +ky - -ky (sine) modes. From these coefficients for linear-polarized modes, the power in the circular-polarized modes can be computed: |ODD-Z+EVEN-Y|2+|EVEN-Z+ODD-Y|2. The power is identical for the two circular-polarized modes with opposite chiralities since the input is linearly polarized and at normal incidence. The transmittance for the diffraction orders are computed from the mode coefficients. As usual, this requires a separate normalization run to compute the power of the input planewave. The anisotropic permittivity of the grating is specified using the material function lc-mat which involves a position-dependent rotation of the diagonal ε tensor about the x axis. For φ=0°, the nematic director is oriented along the z axis: Ez has a larger permittivity than Ey where the birefringence (Δn) is 0.159. The grating has a periodicity of Λ=6.5 μm in the y direction. The simulation script is in examples/polarization_grating.ctl. 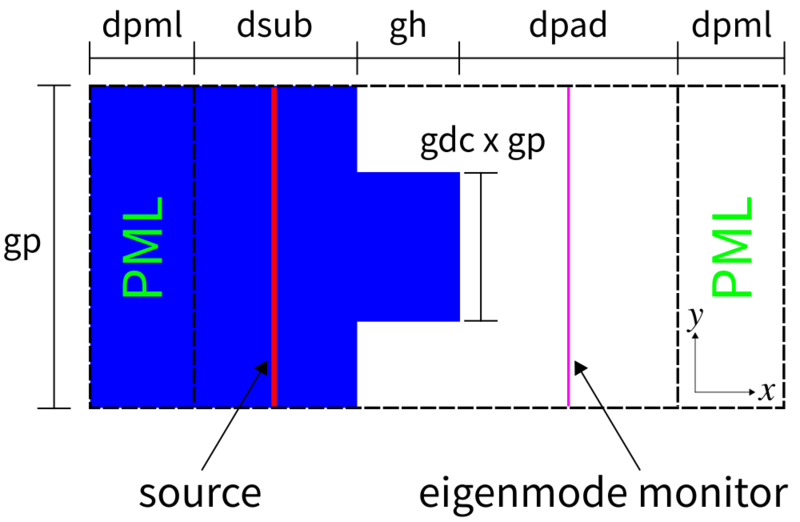 The Bash script below runs the grating simulations over a range of grating thicknesses from 0.1 to 3.4 μm corresponding to phase delays (Δnd/λ) of approximately 0 to 1. The entire output is saved to a file and the transmittance data is extracted from the output and placed in a separate file. The output from the simulation for the homogeneous uniaxial grating is plotted using the script below. The diffraction spectra for the two gratings are shown in the accompanying figures. The left figure shows good agreement between the simulation results and analytic theory for the homogeneous uniaxial grating. Approximately 6% of the power in the input planewave is lost due to reflection from the grating. This value is an average over all phase delays. The total transmittance is therefore around 94%. The twisted-nematic grating, with results shown in the right figure, produces ±1 diffraction orders with nearly-constant peak transmittance over a broader bandwidth around Δnd/λ=0.5 than the homogeneous uniaxial polarization grating. This is consistent with results from the reference. The average reflectance and transmittance for the twisted-nematic grating are similar to those for the homogeneous uniaxial grating. Note that even though the Jy current amplitude is complex in this example, only its real part is used and the resulting fields are therefore still real (the default). The figure below shows a snapshot of Ez within the cell for four different cases: phase delays (Δnd/λ) of 0.5 and 1.0, and planewave circular polarization of Ez+iEy and Ez-iEy. The empty regions on the cell sides are PMLs. The thin solid black line denotes the boundary between the grating (on the left) and air. As expected, for Δnd/λ=0.5 there is just a single ±1 diffraction order which depends on the chirality of the input planewave (this is not the case for a linear-polarized planewave). The angle of this diffracted order (±4.8°) agrees with the analytic result. Snapshots of Ey are similar.